During the early years of manned flight, aviation was a free for all because no government body was in place to establish policies or regulate and enforce safety standards. Individuals were free to conduct flights and operate aircraft with no government oversight. Most of the early flights were conducted for sport. Aviation was expensive and became the playground of the wealthy. Since these early airplanes were small, many people doubted their commercial value. One group of individuals believed otherwise and they became the genesis for modern airline travel. A public auction decided who would win the honor of becoming the first paying airline customer. The former mayor of St. Petersburg, A. C. Pheil, made the winning bid of $400.00, which secured his place in history as the first paying airline passenger. On January 1, 1914, the first scheduled airline flight was conducted. The flight length was 21 miles and lasted 23 minutes due to a headwind. The return trip took 20 minutes. The line, which was subsidized by Florida businessmen, continued for 4 months and offered regular passage for $5.00 per person or $5.00 per 100 pounds of cargo. 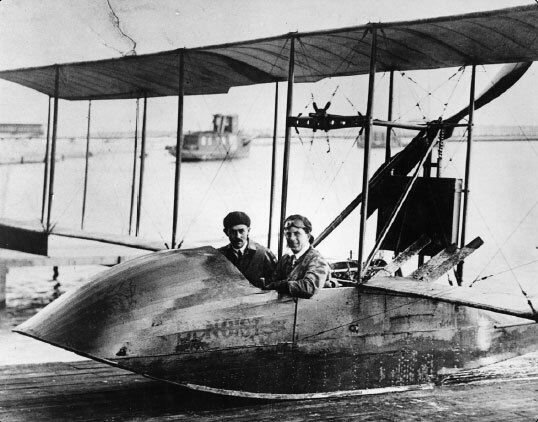 Shortly after the opening of the line, Benoist added a new airboat that afforded more protection from spray during takeoff and landing. The routes were also extended to Manatee, Bradenton, and Sarasota giving further credence to the idea of a profitable commercial airline. The St. Petersburg-Tampa Airboat Line continued throughout the winter months with flights finally being suspended when the winter tourist industry began to dry up. The airline operated for only 4 months, but 1,205 passengers were carried without injury. This experiment proved commercial passenger airline travel was viable. The advent of World War I offered the airplane a chance to demonstrate its varied capabilities. 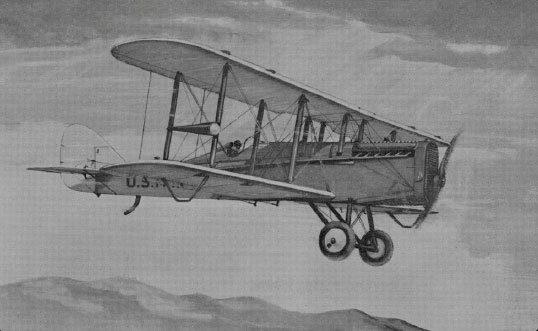 It began the war as a reconnaissance platform, but by 1918, airplanes were being mass produced to serve as fighters, bombers, trainers, as well as reconnaissance platforms. Aviation advocates continued to look for ways to use airplanes. Airmail service was a popular idea, but the war prevented the Postal Service from having access to airplanes. The War Department and Postal Service reached an agreement in 1918. The Army would use the mail service to train its pilots in flying cross-country. The first airmail flight was conducted on May 15, 1918, between New York and Washington, DC. The flight was not considered spectacular; the pilot became lost and landed at the wrong airfield. In August of 1918, the United States Postal Service took control of the airmail routes and brought the existing Army airmail pilots and their planes into the program as postal employees. Airmail routes continued to expand until the Transcontinental Mail Route was inaugurated. 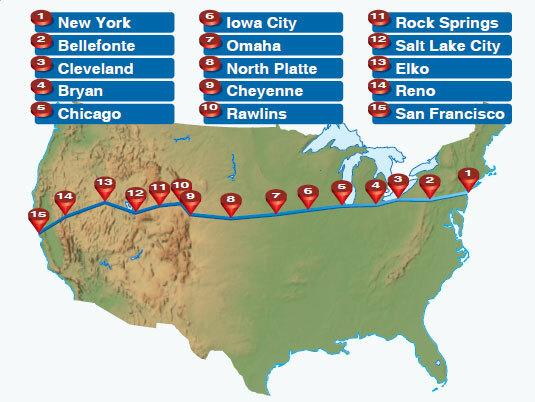 [Figure 1-5] This route spanned from San Francisco to New York for a total distance of 2,612 miles with 13 intermediate stops along the way. [Figure 1-6] On May 20, 1926, Congress passed the Air Commerce Act, which served as the cornerstone for aviation within the United States. This legislation was supported by leaders in the aviation industry who felt that the airplane could not reach its full potential without assistance from the Federal Government in improving safety. Francisco inaugural route in 1921. The Air Commerce Act charged the Secretary of Commerce with fostering air commerce, issuing and enforcing air traffic rules, licensing pilots, certificating aircraft, establishing airways, and operating and maintaining aids to air navigation. The Department of Commerce created a new Aeronautics Branch whose primary mission was to provide oversight for the aviation industry. In addition, the Aeronautics Branch took over the construction and operation of the nation’s system of lighted airways. The Postal Service, as part of the Transcontinental Air Mail Route system, had initiated this system. 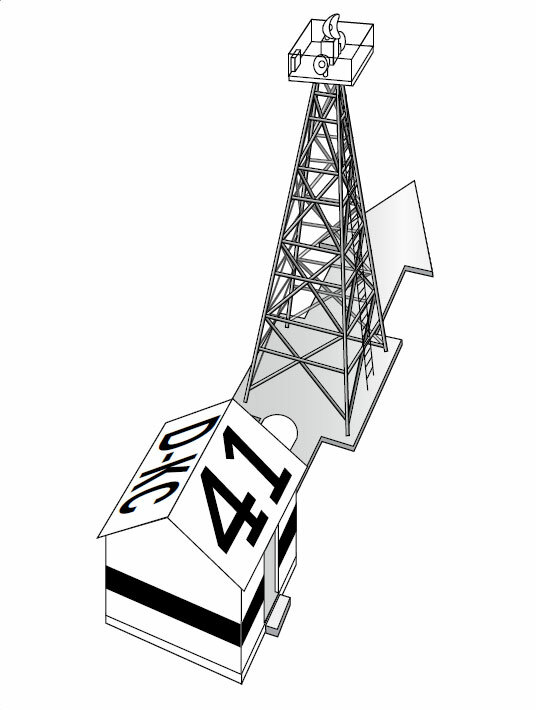 The Department of Commerce made significant advances in aviation communications, including the introduction of radio beacons as an effective means of navigation. The Aeronautics Branch of the Department of Commerce began pilot certification with the first license issued on April 6, 1927. The recipient was the Chief of the Aeronautics Branch, William P. MacCracken, Jr. [Figure 1-8] (Orville Wright, who was no longer an active flier, had declined the honor.) 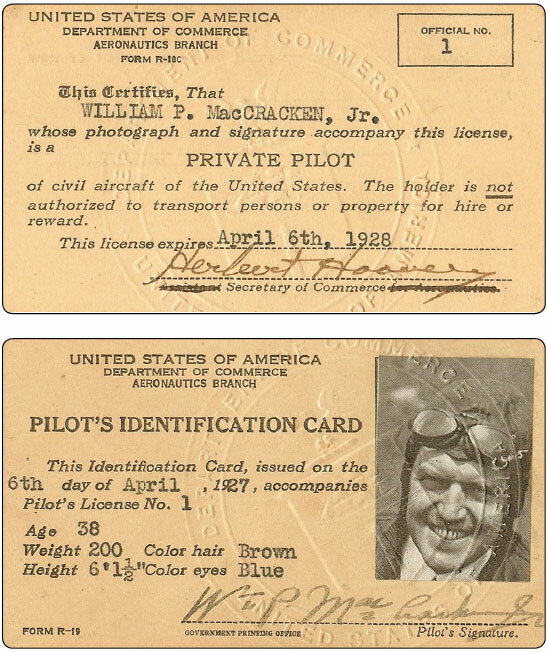 MacCracken’s license was the first issued to a pilot by a civilian agency of the Federal Government. Some 3 months later, the Aeronautics Branch issued the first Federal aircraft mechanic license. Figure 1-8. The first pilot license was issued to William P.
Equally important for safety was the establishment of a system of certification for aircraft. On March 29, 1927, the Aeronautics Branch issued the first airworthiness type certificate to the Buhl Airster CA-3, a three-place open biplane. In 1934, to recognize the tremendous strides made in aviation and to display the enhanced status within the department, the Aeronautics Branch was renamed the Bureau of Air Commerce. [Figure 1-9] Within this time frame, the Bureau of Air Commerce brought together a group of airlines and encouraged them to form the first three Air Traffic Control (ATC) facilities along the established air routes. Then in 1936, the Bureau of Air Commerce took over the responsibilities of operating the centers and continued to advance the ATC facilities. ATC has come a long way from the early controllers using maps, chalkboards, and performing mental math calculations in order to separate aircraft along flight routes. within the Department of Commerce. In 1938, the Civil Aeronautics Act transferred the civil aviation responsibilities to a newly created, independent body, named the Civil Aeronautics Authority (CAA). This Act empowered the CAA to regulate airfares and establish new routes for the airlines to service. 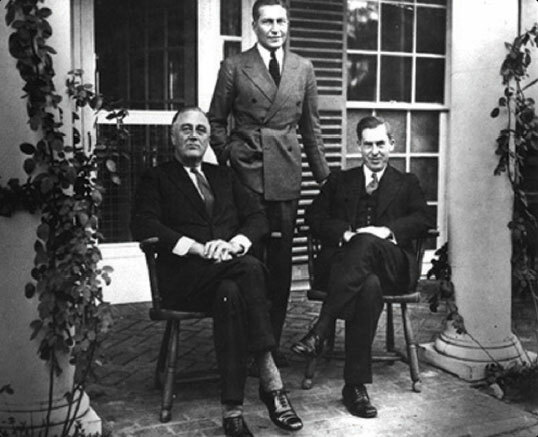 President Franklin Roosevelt split the CAA into two agencies—the Civil Aeronautics Administration (CAA) and the Civil Aeronautics Board (CAB). Both agencies were still part of the Department of Commerce but the CAB functioned independently of the Secretary of Commerce. The role of the CAA was to facilitate ATC, certification of airmen and aircraft, rule enforcement, and the development of new airways. The CAB was charged with rule making to enhance safety, accident investigation, and the economic regulation of the airlines. Then in 1946, Congress gave the CAA the responsibility of administering the Federal Aid Airport Program. This program was designed to promote the establishment of civil airports throughout the country.